Feed for Growth is an exciting programme for farmers providing practical advice, support, resources, and tools to help grow better cows. A Farm enterprise is a longer term business model than most people consider, driven by developing better production animals more efficiently. The first few weeks of life will have the biggest impact on this objective, and therefore the biggest impact on the profitability of your business. We’ll show you the importance of the first year of life and how the first 12 weeks are critical. Increase your focus in this area and the benefits can be substantial. The first three months are the most important period in the journey to 24 months AFC. The unique opportunity will only be realised by creating a positive ‘growth triangle’. All three need to be in harmony to allow good calf performance. Download our informative Farmer’s Guides, covering everything from dealing with common health problems to feeding and housing your calves. Calf scour is the most common disease in dairy bred calves causing mortality and reduced growth rates. Find out more about the causes, impact and what you can do to prevent this disease. Coccidia are a common parasite and an increasingly common cause of diarrhoea in young calves. Find out more about the causes, impact and how to prevent calves from becoming infected. How? Consider your scenario – what labour do you have? What are you trying to achieve with these animals? What growth rates do you believe are possible? What AFC do you want to achieve? Work with Feed For Growth to create a Heifer Roadmap, and manage success using our tools! …all come together to create your calf roadmap. We need to manage three key areas to ensure long term success: Health, Environment, Nutrition. The pre-weaned animal is a fundamental phase of development, and drives the future success of the farm. Plot your Heifer Road Map to see the potential impact of growing better cows. Use our handy feeding calculator to determine values. Targets set, how to achieve them? Feeding appropriately and accurately is an enormously important aspect of the nutrition side of the Growth Triangle. Without a structured approach, it’s very easy to get this wrong. We have plenty of useful information available to help you understand and manage the aspects of this task. Recording data is the only way to really manage your plan. All farms are different, and changes over time to the sides of your Growth Triangle will need review. 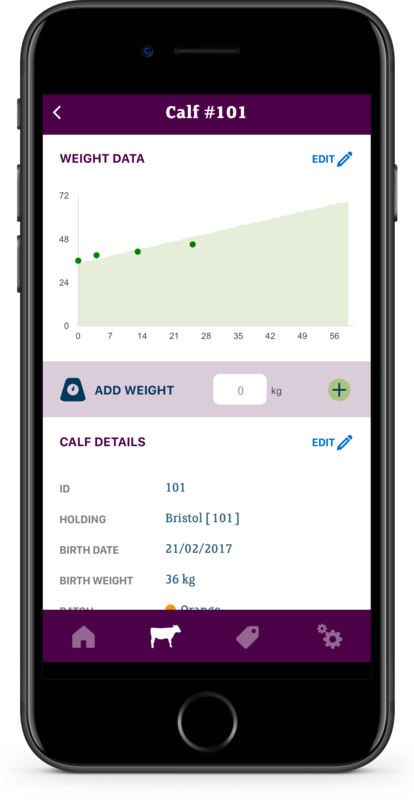 Regularly recording calf weight data is very helpful to monitor progress and impact. …introducing the Feed for Growth smart phone app.